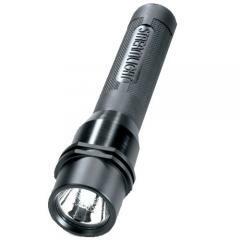 Streamlight's Scorpion X LED with Strobe Flashlight offers the latest in C4® LED technology that is shock, impact, and water resistant, and offers a 50,000 hour lifetime. The lens on the Scorpion X is crafted using tough high temperature glass coated to resist scratches. This light can be operated in three modes plus the added option of momentary or steady on via a one-handed push button tail switch. The strobe flashlight won't roll away if accidentally dropped and features O-ring seals. The Scorpion accepts two 3 Volt CR123A lithium batteries with a 10-year shelf life. Super bright. Nice and compact. Arrived with near dead batteries. Didn't want to work at first but messed with it until it did. It's bright but I don't believe it's the 200 lumens the package claims it is. It's made of rubber and durable metal. It's also designed so that it won't roll away and has a strobe function. Good sturdy flashlight for the money but not blinding bright. Awesome flashlight. Very bright, great grip handle. Has all the guys at work jealous. I love this flashlight It is so bright When I'm out on a traffic stop I have no trouble at all seeing inside the car. The strobe function is great too.